L. Francis Herreshoff - One of the most influential and successful yacht designers of the twentieth century, Lewis Francis Herreshoff, worked for: his father, Capt. Nat Herreshoff; the U.S. Navy in World War I; and for Starling Burgess, before going out on his own. L. Francis was also a prolific writer and—in addition to numerous articles—he authored The Common Sense of Yacht Design, The Compleat Cruiser, Sensible Cruising Designs, An L. Francis Herreshoff Reader, and a biography of his father, Capt. Nat Herreshoff: The Wizard of Bristol. Herreshoff’s writing influenced generations of designers and builders, and—among other innovations—L. 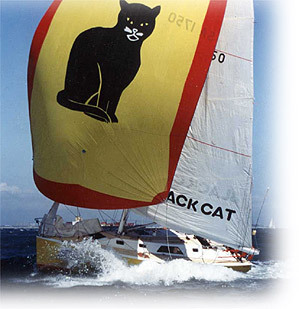 Francis pioneered the concept of the canting keel, which is now so dominant in ultra-high-speed ocean racers such as those that recently competed in the 2006 Volvo round-the-world race. L.F. Herreshoff designed cruising yachts canoes, kayaks and other small craft. Racing designs included the 1930 America’s Cup J-boat, Whirlwind, the incredible Istalena, and the remarkable and innovative R-class sloops Yankee and Live Yankee. His graceful cruising boats such as the ketches Bounty, Tioga, the Araminta, and the schooner Joan are still considered the pinnacle of perfection in form and proportion in boat design. Other famous designs (many intended for home builders) included the Neria, Marco Polo, and the ultra-shoal Meadow Lark, and Golden Ball to name just a few. L. Francis Herreshoff is the sixth designer inducted into the Hall of Fame. Past recipients include: John Alden, Nathanael Greene Herreshoff, C. Raymond Hunt , Philip L. Rhodes, and Olin Stephens. The North American Boat Designers Hall of Fame nominating committee, composed of magazine editors, lifelong designers and educators, as well as leaders at various design/boatbuilding schools and museums, selects nominees each year. Judges then vote for their recommended candidates in order of preference, which is combined with the number of mentions among the judges to produce the winners. In addition to honoring L. Francis Herreshoff, Westlawn also honored Edward S. “Ted” Brewer and Bob Wallstrom with the Norman Nudelman Marine Education Award, in recognition of a lifetime of excellence and achievement in marine education. Ted Brewer is one of the co-founders of the Yacht Design Institute (YDI) and former YDI president Bob Wallstrom recently came aboard as adjunct Westlawn instructors to further enrich the Westlawn faculty. Westlawn also recently acquired the rights to the course material of the former YDI schools. Norm served Westlawn as an instructor in yacht design, supervisor of instruction, and vice president of education, and president before retiring in 1997. Norm is currently Westlawn’s Provost and still very active with the school. Mystic Seaport – The Museum of America and the Sea – is the nation’s leading maritime museum presenting the American experience from a maritime perspective. Located along the banks of the historic Mystic River in Mystic, Connecticut, the Museum houses extensive collections representing the material culture of maritime America and offers educational programs from preschool to post-graduate. For more information, call (888) 973-2767 or visit www.mysticseaport.org. To learn more about Westlawn, please call (860) 572-7900 or visit the Westlawn website at www.westlawn.edu.